Contemporary set adds a modern feel to your dining room, kitchen or breakfast nook. 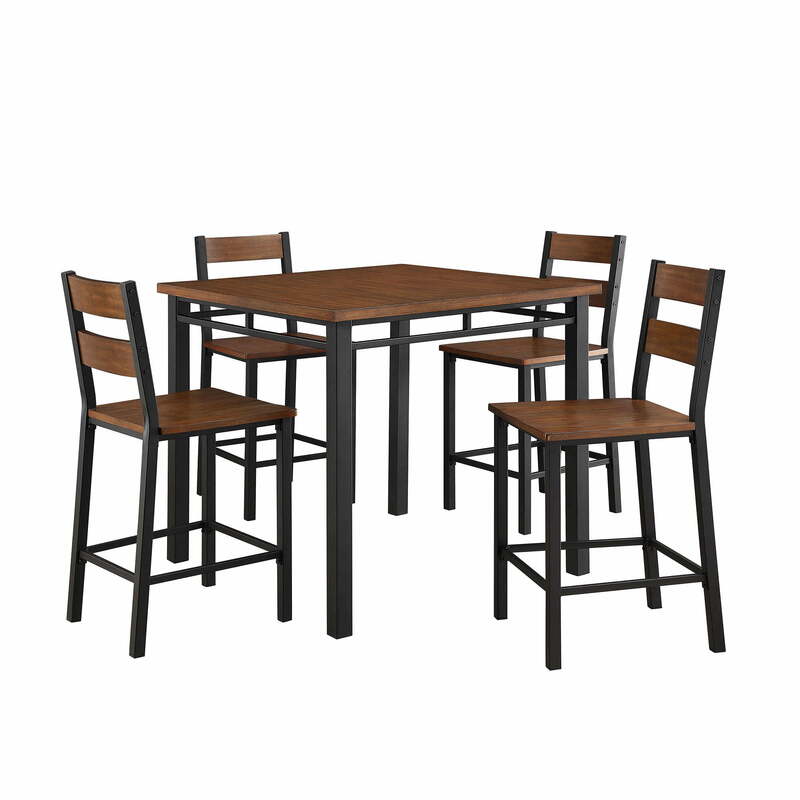 Elegant dinette features a sturdy metal frame and a multi-step finish on the wood seat and back. This high-quality dining set is ideal for small spaces and complements most any decor. Coordinates with other furniture in the Mercer collection. I read the reviews before purchasing so I was expecting it to be a time consuming project. I, alone, put it together (49 year old female) and it took me 4 hours to put the table and 2 chairs together. I received all required materials, except Phillips screw driver, and many extra screws and washers. If you follow the instructions AND DO NOT TIGHTEN YOUR SCREWS UNTIL YOU HAVE PUT EVERYTHING PART TOGETHER, you will not have any issues. The set looks beautiful. It is heavy (took me a while to get the table in an upright position) and feels solid. It fits perfect in my small downtown apartment.My only issue was with delivery. The delivery company held my set in their warehouse 7 extra days due to a breakdown in communication. With single digit temperatures, I think they may be the reason 2 of my chair seats were split in half. However, 1 call to the manufacturer and they are already shipping replacement parts.Great dining room set and I would definitely recommend it to others. Tbook.com crawls the web to find the best prices and availability on products like Better Homes & Gardens Mercer 5-Piece Counter Height Dining Room Set, Includes Table and 4 Chairs, Vintage Oak.... This product is one of the more popular items we list which is why it is in our "hot deals" section. If you have any questions on this product, please give us a call at 734-971-1210 during the hours of 9am - 5pm EST for assistance. Thank you for shopping at Tbook.com, the Internet Department Store!